Finally, its summer here in Michigan, and the Sun is getting higher in the sky every day. Those little expensive sunglasses stores, with the products ranging from $300-$1000 per pair, are busy talking to potential customers about the importance of special lens coatings to filter out UV-light. The sales associates will tell you many facts about "blocking UV-A and UV-B light", both ultraviolet light that you cannot see. Ultraviolet light causes sunburn of course, and can damage chemical components within your skin cells, such as the DNA. Most of us know that suntanning raises your personal risk of skin cancer (melanoma). Australia has a higher incidence of skin cancer compared to the United States. Sales staff will remind you that you already use sunscreens for your skin and they will quote information telling you that as we age, many of us will suffer from age related macular degeneration and cataracts. As an eye health researcher myself, I can tell you that we do know that people who work outside in Sunlight do have higher incidents of cataracts (clouding lenses of the eye) compared to those who work indoors. This is thought to be caused by more exposure to the UV light from the Sun. However, it is also true that $300 sunglasses may actually be increasing the amount of UV-light getting into your eyes if you use them incorrectly! How? Read on for more details. How can sunglasses with coatings to block UV-light cause more UV-light exposure for your eyes? Simple. During most of the day, the Sun is high in the sky and projects light downwards over your glasses, and when its lower in the sky you most often face sideways to the Sun. Again, the Sun's light actually gets around your sunglasses and into your eyes. If light hits the front of your eyes, from any angle, your eye's cornea and lens focus the light onto your retina. Now for the really bad news: your sunglasses darken most of your central visual field, and this causes your pupils to dilate, or open wide. Bigger pupils = larger area to let more light (including UV-light) into your eye. During graduate school in the late 80's I did tests with UV-light meters in London Ontario (Western University, lab of John Trevithick, PhD), and so did Ophthalmology fellows in Boston, who tested combinations of sunglasses and hats to measure how much light gets into the eye. In Boston, they put light meters in the eye sockets of dummy heads (the kind used to hold a hair wig) and put them on the roof for an entire year of four seasons. On the dummy heads were sunglasses, and ball caps in various combinations. The results were quite clear, and maybe surprising. Just using sunglasses alone did decrease the UV light reaching the eyes, but not by much and mostly only during the morning and and dusk. Most of the day, especially in summer, the Sun was high and light came down over the glasses, letting UV reach the cornea. Furthermore, the dummy heads with just a regular baseball hat had far less UV-light exposure to the eyes, even without sunglasses! The eye shade from the hat effectively shaded the eyes from direct sunlight for most of the day. 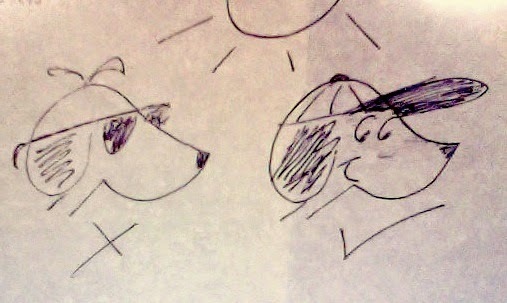 The best situation was a ball cap with sunglasses on, but not dark sunglasses. Researchers also concluded that just wearing sunglasses alone may even be worst on real people, because the darkness of the view causes our pupils to open wide, thus letting in more UV-light. If you have just a ball cap, you block the Sun's direct UV light reaching your eye and the bright landscape in front of you causes your pupils to contract and get very small. This dramatically reduces the amount of light (UV or any color) that can get into your eye. CHEAP SUNGLASSES are as good as $1,000 sunglasses with fancy UV-blocking coatings. Were you ever told that your $300 sunglasses will filter out 99.9% of UV light? Well, sorry to tell you this, but as a scientist that uses light for chemistry and vision science research, I already know that most cheap plastics are already horrible at transmitting UV-light. Yep. It turns out that the $3-sunglasses, from the check-out counter of your Walmart, has cheap plastic that blocks more than 99.5% of UV-light. As a PhD student at Western University (Western Ontario), when spring arrived we would take our lab's UV-meters out onto the "concrete beach" in front of the student center, and measure the filtering ability of student's sunglasses. Those boys and girls from Toronto with $300 shades were not too pleased to learn about plastics and UV-light, and see how well the cheap sunglasses compared to their new Serengeti's, but they won't be fooled again. In the biochemistry lab, we often measure some biochemicals with light spectroscopy, using a wavelength of light in the UV range, such as 340 nm (nanometers). To do those tests we had to use quartz cuvettes to hold our samples, because cuvettes made of plastic adsorbed the UV-light. That many plastics already block UV-light is common knowledge to a chemist. This is not common knowledge in the mall, and you won't hear about it from salespersons in the little sunglasses kiosks. 2. The amount of extra UV light blocking you get from UV Coatings on sunglasses with plastic based lenses compared to cheap plastic sunglasses is almost meaningless. The possible difference of 0.5% is not meaningful, since it turns out that your cornea itself blocks most of the UV-light before it hits the lens, which blocks out more UV-light before it gets to your retina. 3. Sunglasses or not, the best protection is a large brim hat or ball cap to shade your eyes from overhead sunlight. That is when the UV-light flux from the Sun is its most intense. 4. Use "blue blocker" lenses (yellow) and a hat for comfort. The blue blocker lenses block the unfocussed blue light that is bright and glaring, but they are not too dark and let your pupils contract. Combined with an eye shading brim, this is your best protection. $20 blue blockers are just fine. So find yourself a favorite sun hat, and wear it as the Sun comes back to us this spring.